All cards on the table, I’ve double-, triple- and quadruple-checked the reports just to make sure last night wasn’t a dream. Thankfully, it was real. The Cleveland Indians did indeed acquire free agent slugger Edwin Encarnacion. The same Edwin Encarnacion who tied for the AL lead in RBIs last year. Who hasn’t hit less than 34 home runs per season since 2011. Who was seen by many as one of the best bats on the market. That Edwin Encarnacion is now a member of a team which came to within inches of a World Series championship. Celebrate accordingly. Obviously a signing like this causes more than a few double-takes, both from local fans and everyone else around the league. Even when the rumors of Cleveland’s pursuit of Encarnacion first popped up, it all seemed too good to be true. Heck, I personally discounted the idea more than a few times. How could you resist the urge to do so, what with the entire baseball media caveating Cleveland’s chances by noting it was likely a move far too expensive for the club to make? Indians fans were told their favorite team was too small-market to offer enough money to entice one of the best hitters in the game. This just isn’t the kind of move the Indians front office makes, right? Not the typically frugal team which usually just complements the core with spare parts or takes flyers on past-their-prime vets. This is a trend the front office has followed in the past, albeit sparingly. The Indians thought the time was right when they gave up two of their best pitching prospects for starter Ubaldo Jimenez late in the 2011 season. They felt the same way when spending big money on free agents Nick Swisher and Michael Bourn before the 2013 campaign. For the most part, both moves proved to be big-time misses. It’s this backfiring of two ill-fated attempts to swing for the fences which had the team’s execs apprehensive about making marquee moves. Fans saw it as the Tribe being cheap, when in reality the team was just waiting for a perfect moment to pull off a blockbuster instead of betting on fool’s gold. This past postseason created said perfect moment. The Indians pushed the league-best Chicago Cubs to extra innings of World Series Game 7. They did so without two of their starting pitchers, without their best hitter. Attempting to get that far next year relying only on returning players would’ve been admirable, but far too risky. Cleveland was finally on the brink of being a consistent contender, it just needed one big piece. The front office realized this, and made good on its word to spend when the stars finally aligned. As a result, one of the league’s more potent hitters is slotted into an already intimidating lineup. Encarnacion now becomes a clear cleanup hitter, surrounded on the lineup card by the steady offense of Jason Kipnis and Carlos Santana. By budding superstar Francisco Lindor. By 2016’s breakout performer, Jose Ramirez. And, provided he’s back to full-strength, the consistently great Michael Brantley. Of course, all that talent on offense makes it easy to forget the Indians’ bread and butter – their starting rotation. This, too, returns fully intact. Ace Corey Kluber will go back to having his starts followed by Danny Salazar and Carlos Carrasco. Josh Tomlin and Trevor Bauer will carry the back end, while young guns full of potential like Mike Clevinger and Ryan Merritt provide the kind of rotation depth teams would kill for. Oh, and then there’s the bullpen, anchored by last postseason’s most fearsome reliever, Andrew Miller. Cleveland’s front office saw everything it already had in the clubhouse, knowing full-well that a solid addition or two could turn this team into one of the AL’s best. The Tribe knew it couldn’t let this window of contention close without going for broke. Having come just one run short of ending a 68-year championship drought, there was no way the Indians could’ve risked not doing everything they could to get back for another try. It was finally the moment Cleveland’s higher-ups were waiting for, the time when it was clear they had to spend big. 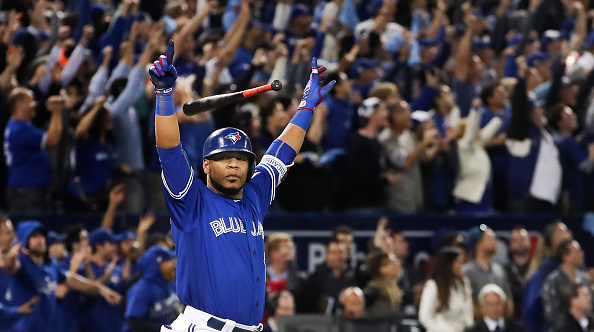 They kept their word, adding Encarnacion to a team which has now become a powerhouse.